Beer, Cider, and seasonal Farm-to-Table creations along with Ziplining & River Tubing adventures. Enjoy your beer in the great outdoors. Blind Squirrel Brewery features beer and cider crafted on site, as well as pub menu favorites and seasonal Farm to Table creations from both of our kitchens. Take advantage of dining on our decks situated directly along the North Toe River or take a relaxing float from upstream on a tubing excursion. We also offer an 18 hole putt-putt disc golf experience at the brewery in addition to 18 full holes at the campground. Brewery Tours are available by phone or by reserving online. Limited lodging is available on-site at the brewery location while the majority of available lodging is at the Farm Retreat property. Whenever possible, meals are prepared with fresh seasonal vegetables, fruits, and herbs from the brewery’s own farm located just one mile away. Blind Squirrel Ziplines & Farm Retreat offers guided canopy zipline tours, our mountain disc golf course, and a wide variety of lodging from camping to cabins. The experience is centered on being outside and connecting with the property. Our farm operations consist of vegetable gardens, mini-orchard, berry bushes, pumpkin patch, greenhouses, chickens for eggs, and trout from our own pond. A shuttle is offered to Farm Retreat guests to and from the brewery location for a safe and worry free experience! Lodging, tubing, ziplining, and food operations are available 7 days a week during the months of May-October and limited to weekends during the off-season. Hearty breakfasts are available everyday for those staying on site in one of our various lodging spaces from B&B, cabins, camping, and more. 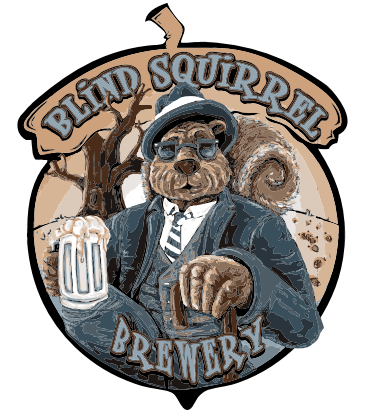 The Blind Squirrel Brewery can accommodate groups up to 100 for special occasions. OPEN SEVEN DAYS A WEEK from May-October, which allows visitors to enjoy our Ziplining, River Tubing (by reservation), Taproom, and limited Menu Items throughout the week. Restaurant & tasting room in Plumtree is open on weekends all year long. Blind Squirrel operates four separate three barrel systems, giving them a range of diversity that is unsurpassed in the High Country. What started as a true nano-brewery has now evolved into a micro-setup that is unlike any other. Cheers!